In 2009, then California governor, Arnold Schwarzenegger signed SB-407 into law. The law requires that water-efficient fixtures be installed in homes and commercial properties. Any toilet manufactured to use more than 1.6 gallons of water per flush. Any urinal manufactured to use more than one gallon of water per flush. Any showerhead manufactured to have a flow capacity of more than 2.5 gallons of water per minute. Any interior faucet that emits more than 2.2 gallons of water per minute. One of the main features of this law is that as of January 1, 2017 all water fixtures in a single-family home are to be replaced with water-efficient fixtures. Most homes that have undergone a major, permitted remodel after 2014 were required to update plumbing fixtures to water-efficient fixtures to obtain a building permit. b) On or before January 1, 2017, noncompliant plumbing fixtures in any single-family residential real property shall be replaced by the property owner with water-conserving plumbing fixtures. This law requires that the seller must disclose to buyers if the fixtures in their home are in compliance with this law. Do you know if all of your fixtures are in compliance? I certainly don’t. This will likely require you to either update all the fixtures to low flow, or have an inspection certifying that they are low flow. Based on the definition of multifamily residential real estate as containing more than one unit intended for human habitation, most duplexes, triplexes, and fourplexes should fit into this category. Again the law requires that the seller of commercial real estate or multifamily property disclose to the buyer if the property is in compliance. Does this mean that the state is going to create the plumbing police? Beats me. The law does allow for local communities and water retailers to enact ordinances to enforce compliance. Check with your local municipalities and water district to see if they have an enforcement mechanism. If you are considering selling residential real estate in the near future you will need to work with your real estate professional to comply with this law. Hiring a property inspector can go a long ways towards this. It looks like the plumbers, handymen, and handywomen of California are going to have a lot of faucets to fix. Senate Bill 655 was signed into law on October 9, 2015 and went into effect on January 1, 2016. This law adds mold to the list of habitability issues that a tenant can use in defense of an eviction case. How is mold defined under SB 655? “Mold” means a microscopic organism or fungi that can grow in damp conditions in the interior of a building. The California Apartment Association boasts that this law protects both the landlord and the tenant. The tenant is protected from the harmful effects of exposure to mold over an extended period of time. The landlord is protected from eviction defense attorneys using “mold” as a last minute defense in an unlawful detainer proceedings. To qualify as a habitability issue, the mold must be visible, the landlord must have been notified of its presence, and it must NOT be attributable to the tenants misuse or neglect. ANSWER: “Yes. Even where it’s clear that the tenant’s own negligent actions have led to the mold problem, the conservative course of action from a risk management perspective, is to act quickly to repair the problem. Afterwards, if it’s clear that the tenant had caused the problem, the landlord may bill the tenant for the cost. The California Association of Realtors® provides a standard form, “Lease/Rental Mold and Ventilation Addendum”, for dealing with mold issues when you are leasing a unit. You can use it to address some of these issues when a new tenant takes occupancy. You should always address tenant issues with your legal counsel to get their advice on matters pertaining to law. Newly signed mold bill protects both landlords and tenants – C.A.A. Some interesting takeaways from the graphic above. The final sales price grew by a whopping 17.2% from 2014 to 2015. “Good deals” are getting harder to find. I think the costs of rehab are rising because contractors are busier. They are having to pay their employees more to retain them. Some contractors are experiencing a shortage of labor. 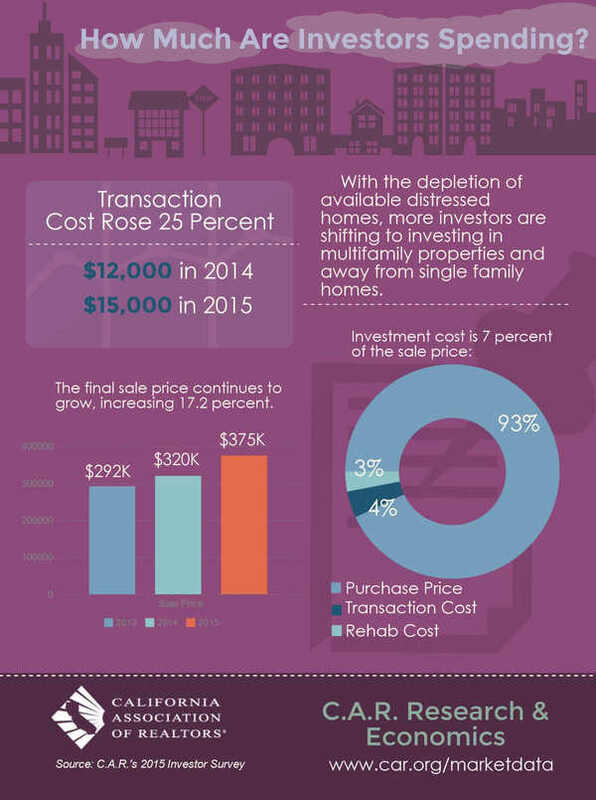 As equity in housing increases, expect to see more owners renovate their homes. This will keep upward pressure on construction costs. If you have questions about investing in real estate, please feel free to reach out to me via phone or email. Using a Section 1031 Exchange to trade from one property to another is a common event. Most of the time owners are seeking higher returns. In the case below, my clients were looking to go from a tired property to a much nicer property. I was contacted to list a property in Concord for a client. 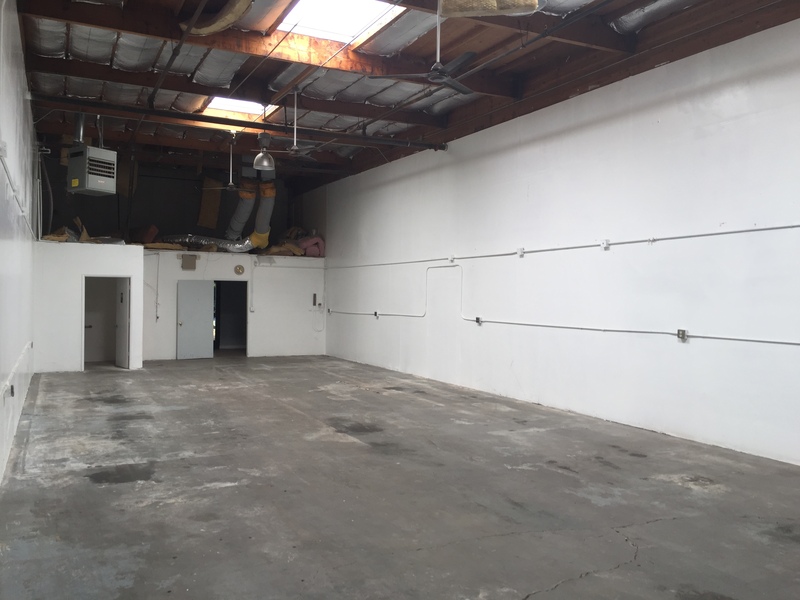 The property was a 2 unit property with great access to Concord BART. The property was not in the best of shape. It had been a rental for 30+ years and some of the tenants had beaten the property up. While listing the property we learned that one of the tenants was going to be an issue and had to process an eviction in the midst of trying to sell the property. To complicate the matter, the owners had performed a 1031 exchange in the 1980’s when they bought the property. I advised them to consult with their CPA regarding their potential tax liability if the property was sold and not exchanged. After forwarding the estimated sales price to their CPA, she determined that the owners would likely have to pay nearly 50% of the sales proceeds in taxes. It immediately became clear that we should perform a 1031 exchange to preserve that equity to pass on to their heirs. When we listed the property we got a significant amount of interest. We parlayed that interest into multiple offers and almost $30,000 above asking price sale. Since a 1031 exchange has strict timing guidelines, I recommended to my clients that we include a provision that extended the amount of time we had to close the “down-leg” of their transaction. My clients determined that they wanted an easy-to-own rental property that was going to attract a high caliber of renters. Their plan was to pass this asset along to their heirs. Consequently, they don’t want something that is going to be high maintenance. Thankfully, we negotiated for more time in the contract as the market was thin on investment properties. The first property we pursued was snapped up from under our noses. Finally, after submitting offers on a couple of places my clients got into contract on a home in Concord. Using the 1031 Exchange funds and additional capital we were able to secure a purchase with an all cash 14-day closing. This appealed to the sellers as they were in contract on another home to buy. This property is a nice 3-bedroom 2-bath home with granite countertops and a killer kitchen. My clients were more than pleased with the purchase. My clients were able to accomplish their goal of selling a property that was causing headaches and transferring the equity into another more attractive property. 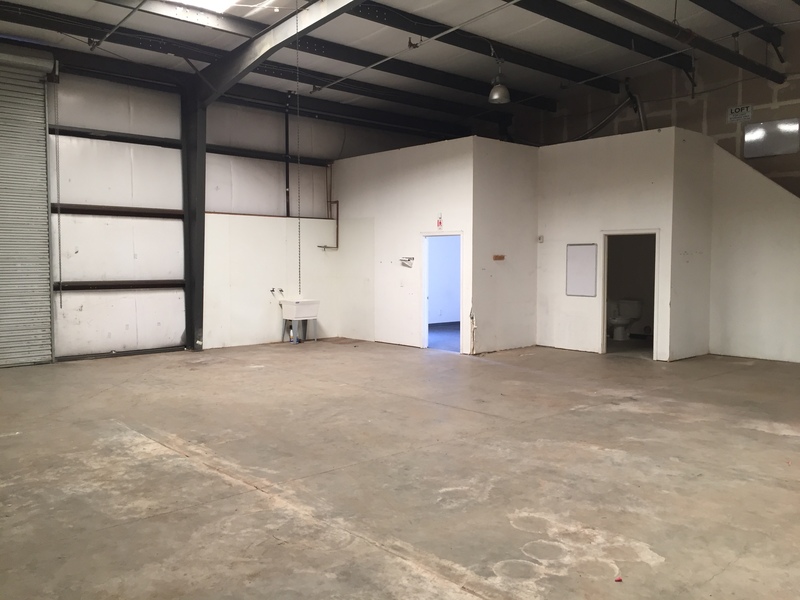 This transaction allowed them to accomplish their goal of deferring capital gains tax and to provide their heirs with a more attractive investment property. It is important to have an agent that can help you navigate the 1031 Exchange Process. If you or someone you know is thinking of selling an investment property, have them give me a call for a no obligation consultation at 925.385.8798. As a real estate professional, you might expect me to say, “It’s a great time to buy real estate.” You could think I am biased, and I may be. Right now there are two factors that provide a unique opportunity to invest in duplex, triplex, and fourplex properties. Banks consider 2-4 unit properties as residential properties. This means they are qualify for Freddie Mac and Fannie Mae underwriting guidelines. You can get a great interest rate on these properties. The rates are going to be 0.5% to 1.0% higher than owner-occupied rates. Right now this means that borrowers with good credit and verifiable income can get an interest rate in the 4.25-4.85% range fixed for 30 years. 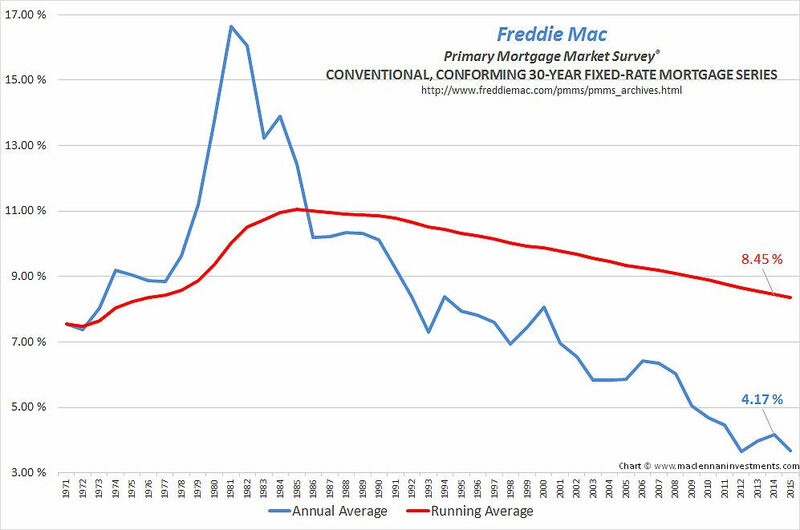 Historically rates have been much higher. You can see from the chart below that the historical average since the 1970’s is around 8.4%. Underwriting this type of loan is straightforward. For more information on financing these purchases read my article on Financing a Duplex, Triplex or Fourplex. Borrowers will generally need 25% to 30% of the acquisition price as a down payment to finance the purchase. If you are considering real estate investing, now is a good time to get off of the sidelines and to invest in well located real estate. Call me today to discuss properties that are currently available on the market at (925) 385-8798.